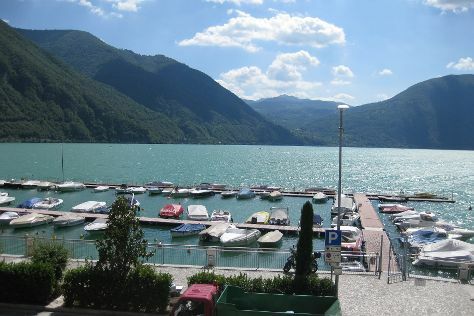 Located in the popular holiday region of Ticino, Lugano is the largest Italian-speaking town in Switzerland. Kick off your visit on the 31st (Mon): step into the grandiose world of Castelli di Bellinzona, then explore the historical opulence of Castelgrande, and then stroll through Lido di Lugano. Keep things going the next day: take in the awesome beauty at Monte San Salvatore. For photos, traveler tips, more things to do, and tourist information, you can read our Lugano tour planner. Use the Route module to find suitable travel options from Sydney, Australia to Lugano. Traveling from Sydney to Lugano, you'll gain 9 hours due to the time zone difference. Traveling from Sydney in October, expect Lugano to be a bit cooler, temps between 20°C and 10°C. Wrap up your sightseeing by early afternoon on the 1st (Tue) to allow enough time to travel to Barcelona. On the 2nd (Wed), kick back and relax at La Barceloneta, then wander the streets of El Barri Gòtic, and then appreciate the history behind Casa Batlló. Here are some ideas for day two: don't miss a visit to Park Güell and then admire the landmark architecture of La Sagrada Familia. To see ratings, traveler tips, where to stay, and more tourist information, go to the Barcelona travel itinerary planner. The Route module can help you plan travel from Lugano to Barcelona. Expect a bit warmer temperatures when traveling from Lugano in November; daily highs in Barcelona reach 21°C and lows reach 13°C. Wrap up your sightseeing by early afternoon on the 3rd (Thu) to allow enough time to fly to Venice. Kick off your visit on the 4th (Fri): wander the streets of Cannaregio, appreciate the extensive heritage of St. Mark's Square, snap pictures at Bridge of Sighs, then explore the activities along Grand Canal, and finally contemplate the long history of Harry's Bar. On your second day here, take in the views from Ponte di Rialto and then enjoy the sand and surf at Lido Beach. To find ratings, reviews, traveler tips, and other tourist information, use the Venice trip builder. Getting from Barcelona to Venice by flight takes about 5 hours. Other options: drive; or take a train. Plan for little chillier temperatures traveling from Barcelona in November, with highs in Venice at 15°C and lows at 7°C. Finish your sightseeing early on the 5th (Sat) so you can take a train to Rome. Get outdoors at Sabbianera Super Beach and Mediterranea. Colosseum and St. Clement Basilica will appeal to history buffs. Next up on the itinerary: admire the striking features of Pantheon, wander the streets of Trastevere, and make a trip to Rome Historical Center. To see reviews, photos, where to stay, and more tourist information, you can read our Rome trip itinerary maker. You can take a train from Venice to Rome in 4 hours. Alternatively, you can do a combination of train, flight, and bus; or drive. Traveling from Venice in November, expect nights in Rome to be about the same, around 9°C, while days are somewhat warmer, around 20°C. Wrap up your sightseeing by early afternoon on the 8th (Tue) to allow time for travel to Athens. Deepen your sense of the past at sights like Plaka District and Parthenon. Get in touch with nature at Glyfada Beach and Mount Lycabettus. The adventure continues: steep yourself in history at Acropolis of Athens, explore the world behind art at National Archaeological Museum, see the interesting displays at Acropolis Museum, and appreciate the history behind Temple of Olympian Zeus. To find maps, more things to do, photos, and other tourist information, read our Athens holiday planner. You can do a combination of subway, flight, and train from Rome to Athens in 5 hours. Other options are to do a combination of car and ferry; or take a bus. You'll lose 1 hour traveling from Rome to Athens due to the time zone difference. In November, daytime highs in Athens are 22°C, while nighttime lows are 13°C. Finish up your sightseeing early on the 11th (Fri) so you can travel back home.